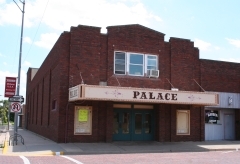 Constructed in 1917, the Palace Theater is a brick, two-part commercial block with a concrete foundation. It is a vernacular commercial block modified to accommodate its specialized use as a movie theater. Patterned brickwork is the primary ornamentation on the front façade. The interior includes alterations made in 1930 and 1950 from Art Deco moldings to 1950s Modern light fixtures. The theater was nominated as part of the "Historic Theaters and Opera Houses of Kansas Multiple Property Submission" for its architecture and association with local recreation history.